March 23, 2011 â€“ Los Angeles, CA â€“ Today at comic book shops worldwide one of the genreâ€™s most celebrated franchises returns with Clive Barker ushering in a new vision of Hell in the all-new ongoing HELLRAISER comic book series! BOOM! Studios celebrates this launch with an all-new, all-original â€œPRELUDE TO HELLRAISER #1â€ PDF available for download FREE from your favorite horror and comic book news sites â€” both written by Clive Barker himself. If you want to read it – head over to Bleeding Cool for your freebie! Thatâ€™s right, to kick off the release of HELLRAISER #1 â€” available in comic shops across the nation today â€” Clive Barker and BOOM! Studios is making available for download an absolutely free, all-new, all-original â€œPRELUDE TO HELLRAISER #1â€ to whet your appetite for the insidious horrors of HELLRAISER #1. So head on over to your favorite horror or comic book news site to get the â€œPRELUDE TO HELLRAISER #1â€ and check it out. After youâ€™re done reading, spread the word, and share the PDF by emailing, tweeting, facebooking, and torrenting as much as humanly possible. Help us evangelize the new series to all those horror fans, Hellraiser fans, and Barker fans that may not know about the comic or havenâ€™t ever been exposed to comics. The biggest and the best comics and horror sites have joined BOOM! to launch this franchise classic with its original founding father, Barker himself. BOOM! will be updating its Twitter account with locations where you can download this must-have Hellraiser essential! Search the hashtag #HellraiserPrelude to suss out participating sites! BOOM! Studios has made it easier than ever to join Clive Barker, who along with writing partner Christopher Monfette and HELLBLAZER artist Leonardo Manco, serve up a masterfully chilling trip through Hell and bring fresh nightmares to new and old fans alike. This new comic book series marks only the third time Barker has written the character: first in the original novella THE HELLBOUND HEART, second in the original seminal horror classic HELLRAISER film. Visit your favorite horror and comic news websites to download your free copy of the all-original PRELUDE TO HELLRAISER #1, then run to your local comic shop to pick up your copy of HELLRAISER #1! 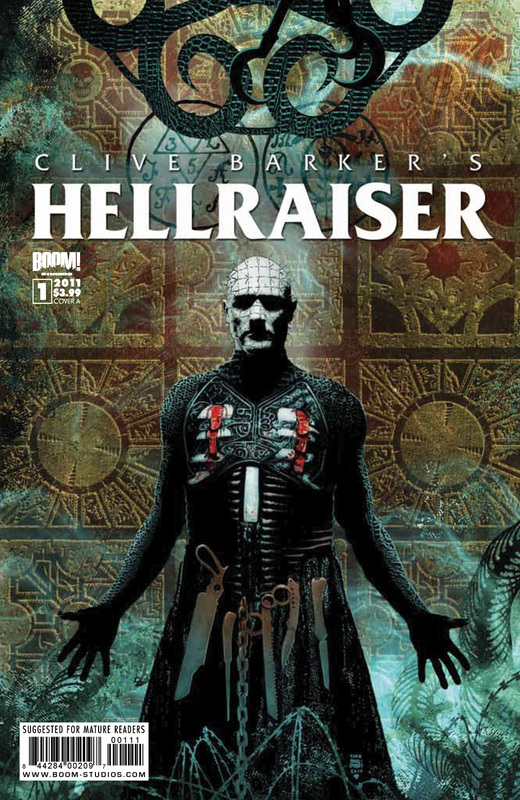 HELLRAISER #1 and the PRELUDE TO HELLRAISER #1 PDF are written by Clive Barker and Cristopher Monfette with art by the sensational Leonardo Manco (HELLBLAZER). HELLRAISER #1 is a 40 page giant with a back-up story by Larry Wachowski (THE MATRIX) and Marc Pacella and ships with A & B covers in a 50/50 split with art by Tim Bradstreet and Nick Percival respectively, as well as a very special 1-in-50 incentive cover drawn and signed by legendary master of horror Clive Barker himself! This title is suggested for Mature Readers. To find a local comic shop near you go toÂ www.comicshoplocator.com. With back-to-back 2009 and 2010 â€œBest Publisherâ€ awards, BOOM! Studios (www.boom-studios.com) generates a constellation of best-selling comic books and graphic novels with the industryâ€™s top talent, including Mark Waidâ€™s IRREDEEMABLE, Stan Leeâ€™s SOLDIER ZERO, THE TRAVELER, and STARBORN (the first new series in print from the industry icon in 20 years), new HELLRAISER comics written by Clive Barker as well as 20th Century Foxâ€™s PLANET OF THE APES, 28 DAYS LATER, and DIE HARD, Philip K. Dickâ€™s DO ANDROIDS DREAM OF ELECTRIC SHEEP?, and The Henson Companyâ€™s FARSCAPE. BOOM!â€™s recently rebranded all-ages imprint KABOOM! will see publication of PEANUTS, SPACE WARPED, Roger Langridgeâ€™s SNARKED!, Scholasticâ€™s WORD GIRL and DUCK TALES, as well as continuing to publish fan-favorite Disney Afternoon series DARKWING DUCK, CHIP â€˜Nâ€™ DALE RESCUE RANGERS along with Disney standards MICKEY MOUSE, DONALD DUCK, UNCLE SCROOGE, and WALT DISNEYâ€™S COMICS AND STORIES.